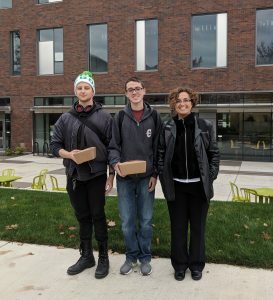 On November 3rd and 4th, Professor Xenia Mountrouidou (Professor X) and two students, Nate Smith, a junior in Computer Science, and Blaine Billings, a sophomore in Computer Science and Mathematics, attended the 2017 GENI Regional Workshop (GRW) at the University of Oregon in Eugene. The GRW Regional Workshop serves both a general audience and members in the computer networking field and features talks by leading figures in the field on cutting-edge topics such as software-defined networking (SDN), edge computing, and network security, as well as lectures and hands-on tutorials for audiences at both the introductory and advanced levels. Professor X was invited to facilitate tutorials related to her National Science Foundation project: CyberPaths – Cyber Security in Liberal Arts Colleges. These tutorials included several labs that were inspired by her research in different security areas and which were used not only in her classes here at the College of Charleston but at such institutions as Northeastern Illinois University in Dekalb, Illinois, Evergreen State College in Olympia, Washington, and Mercer University in Savannah, Georgia. Specifically, Professor X presented her work on Denial of Service Correlation and Mitigation Using Software Defined Networking and as well as Covert Storage Channel Communication, disciplines on which she has published several papers and which can be read by following this link: https://blogs.cofc.edu/mountrouidoux/publications/. Approximately thirty participants attended her workshop, including College of Charleston’s Computer Science undergraduate students Blaine Billings and Nate Smith. As this annual workshop is mainly geared toward professors, PhD students, and postdocs, having undergraduate students in attendance is both uncommon and noteworthy. Blaine and Nate provided teaching assistance during one of Professor X’s tutorials, helping other participants with practical experimentation issues. Overall, it was a well-attended regional workshop that offered good visibility to the research and education that faculty encourage and cultivate here at the College of Charleston. Professor X and both students were awarded travel grants through the NSF GENI project for this conference.